Eurosoft Test Experts Bundle provides a 3 prong testing approach. Pc-Check UEFI delivers direct, legacy free hardware testing. Independently test hardware – not the drivers – directly accessing essential UEFI components. Independent of operating systems, Eurosoft Pc-Check® determines hardware faults and reduces returns, RMAs and repairs, and is the hardware testers’ choice for original, self-booting diagnostic software. Pc-Check® Windows® provides powerful Windows® based testing, fully compatible with Windows 10, Pc-Check Windows diagnostic software ensures that components are reliably tested and validated in the environment in which they are used. Pc-Check UEFI directly tests the latest UEFI enabled hardware with or without secure boot enabled. Pc-Check Windows work precisely with Windows to test hardware in its intended operating system environment, including WINPE. Pc-Check® and Pc-Check® UEFI combine for the ultimate bare metal testing solution for legacy, and new UEFI based PCs all on one single package. 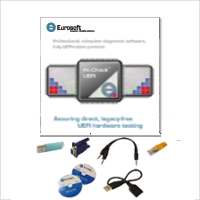 Eurosoft Pc-Check® UEFI is the original, pure and “native” UEFI hardware testing software. No operating system in the way – no Linux, no Windows, no secure boot interference – only pure UEFI testing in real native-UEFI mode. Pc-Check® determines hardware faults and reduces returns, RMAs and repairs, and is the hardware testers’ choice for original, self-booting diagnostic software. Fastest loading, the only true Native UEFI testing for the latest UEFI PCs. Pre Boot Diagnostics run even with Secure Boot enabled. Automatic detection of UEFI or legacy hardware launches either Pc-Check or Pc-Check UEFI. Test the hardware, not the drivers. No operating security, interference or updating Linux and Microsoft. No need to rely on 3rd party boot solutions like Linux. Maintain the ‘chain of trust’ avoiding infection from malware and viruses. 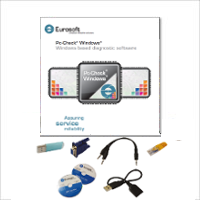 Eurosoft Pc-Check® Windows® is a powerful and widely-installed Windows-based diagnostic software program that ensures that PCs are reliably tested and validated before they leave the factory, during upgrading and servicing. 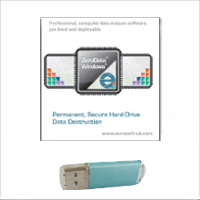 Eurosoft ZeroData™ Windows® permanently and safely removes all of the data on hard drives and exceeds the data destruction levels specified by major organisations and Government bodies, such as NIST and ISO/IEC, for PC reassignment, upgrades, refurbishment, recycling and donation. Eurosoft PC Builder™ is a powerful test management and diagnostic deployment software suite that provides the process framework for PC manufacturers and service organisations to achieve production goals without reducing manufacturing and servicing productivity. 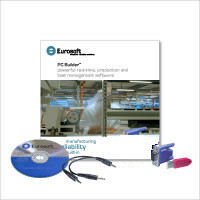 Extend and enhance your test procedures with Eurosoft’s proven PC Diagnostic Programs and unique test accessory hardware. 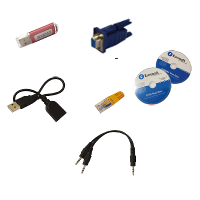 Each computer testing accessory is developed to work specifically with Eurosoft’s test programs providing you with independent and reliable test results of peripheral ports and media devices. Test Accessories improve test methods two ways: 1) They deliver essential, independent test data to hardware; 2) They validate test output results from Eurosoft software. 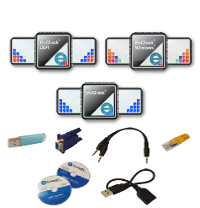 Test Accessories enhance and complement Eurosoft PC Builder™, Pc-Check® UEFI, Pc-Check® Windows®,and Pc-Check® with hardware diagnostic and test processes for communication, media and system performance. Automated Network Deployment Automatically run configuration and diagnostics on the network, Network deployment of updates, Including quick, on-the-fly additions. Windows Compatible Fully compatible with Microsoft WinPE, XP SP2 and later. [PC Builder includes Windows Server 2003, Windows Server 2008]. Manual Logging Available Log case scratches, missing manuals, etc. for inclusion in system record. Record and Monitor System Fail/Pass Proprietary database stores and manages millions of component build data, test scripts, options and service records. Data Mining Analyze process data – display charts showing top failing components, tests, areas and more. Proprietary Intellectual Property…it’s all Eurosoft’s!